Much of what we know about now-extinct brands of hot sauces comes from bottle collectors. There is not a great body of material on the subject of collectible hot sauce bottles, but we are indebted to Betty Zumwalt, author of Ketchup, Pickles, Sauces: 19th Century Food in Glass, who dutifully catalogued obscure hot sauce bottles found by collectors. 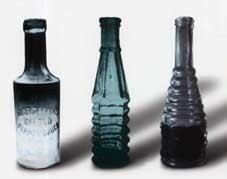 Many bottles in the hands of collectors were uncovered from archaeological digs and shipwrecks…. Story continues here.